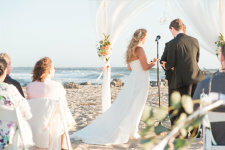 Beachside Memories provides beautiful beach decor packages for Ventura County beach weddings. We’re a mobile business so you can choose any location. We have 3 packages to choose from or we can design a custom look for you. We will take care of the set up and the clean up, and you get to enjoy every moment of your special day. We want to make your beach side memories come true!